Free Printable Doc McStuffins Word Search. Free Printable Doc McStuffins Word Search activity for kids. A fun activity from the Disney Doc McStuffins TV episodes that you can give to your kids at home or school. Search for favorite characters from the Pet Vet Doc McStuffins. You can share this activity with all your friends, students, parents, neighbors and educators. Find names from Doc McStuffins like Dottie, Chilly, Stuffy, Lambie, Henry, Hallie, Gabby, Alma, Bella, Boppy, Donny. This easy word search includes 12 Doc McStuffins words and the answers on page 2. 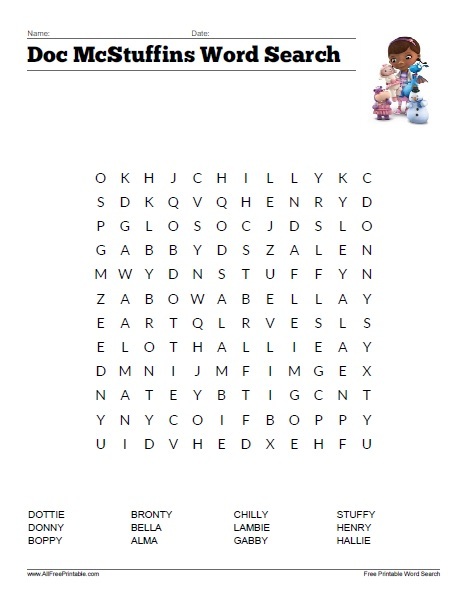 The Doc McStuffins Word Search Puzzle is ready to print in PDF format.